Such were the instructions of the Apostle Paul to the pastor, Timothy. Men called to the task of Gospel work are to “reprove, rebuke and exhort” both in season and out of season. The words used here for “in season” and “out of season” are the Greek eukairos and akairos, and designate both times in which such work is convenient and inconvenient (as the Holman Christian Standard Bible translates it). In other words it is always the season for reproof, rebuke and correction. Except, of course, for charismatic prophet, Dr. Michael Brown. The following transpired a few short days ago via the social media platform, Twitter. Brown was speaking of floods in India and Bangladesh, as reported by The Independent. The floods have, according to the headline, killed over 1200 and left millions homeless. 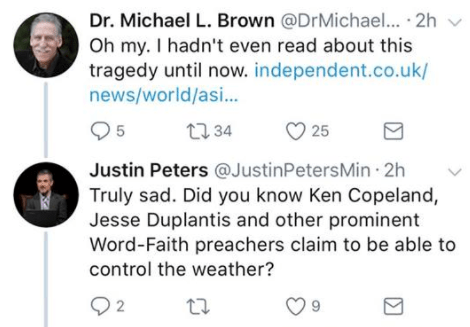 The polemicist and preacher, Justin Peters, chimed in with an obvious observation…Word-Faith preachers (including those supported and promoted by Dr. Brown) claim to control the weather. It should come as no surprise that those claiming prophetic power also claim to control the weather, as this feat was performed by Elijah (passage link). This feat is also – as Peters points out – claimed by Kenneth Copeland and Jesse Duplantis, as demonstrated in the video below (for the former). When confronted with the false prophetic claims of his charismatic peers, Brown regularly claims ignorance. As Justin Peters pointed out in 2014, when it comes to the most famous names of charismaticism, ignorance is not an excuse. But, knowing that Brown has even implausibly claimed not to be familiar with Benny Hinn’s ministry, Peters thought it an opportune time to point out that Brown’s colleagues seem impotent to control that which they claim to be able to control (indeed, for the Copelands were unable to stop the recent hurricane in Texas). 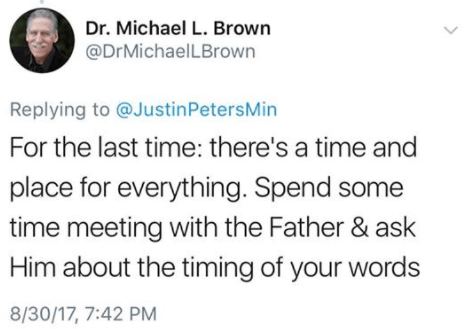 But according to Brown, flood season is no time to do what the Scripture says should always be done, regardless the season. Of course, it’s possible to have both an active prayer life and to perform ministerial functions of reproof and correction, even though Dr. Brown seems to make it an either-or scenario. While the world is groaning under the curse of sin made manifest in natural disasters, one would think it would be the perfect time to distinguish true gospel from false. But again, for Dr. Brown, it is not the season to reprove or rebuke. Furthermore, Brown equates reproof and correction with “mocking,” when in fact, the only mocking going in is from charistmatics towards the Holy Spirit. 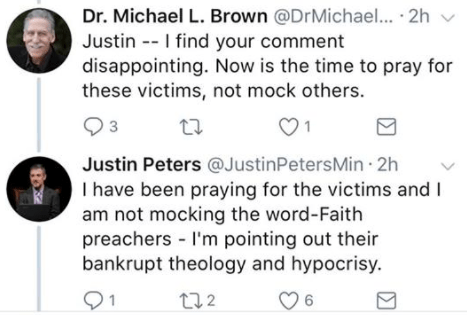 For those who make a living peddling the excesses of the charismatic movement upon claims of false miracles and wonders – as does Dr. Brown – it is never the time or place for discernment.